After Republicans passed sweeping tax reform Wednesday, some of the largest employers in America began dropping cash bombs on their employees. The businesses also pledged to invest hundreds of millions of dollars into the American economy. The GOP tax bill cuts the corporate tax rate nearly in half. Here is a round up, so far, of companies that are celebrating the tax cuts by enriching their employees. Based on the passage of tax reform and the FCC’s action on broadband, Brian L. Roberts, Chairman and CEO of Comcast NBCUniversal, announced that the Company would award special $1,000 bonuses to more than one hundred thousand eligible frontline and non-executive employees. Roberts also announced that the Company expects to spend well in excess of $50 billion over the next five years investing in infrastructure to radically improve and extend our broadband plant and capacity, and our television, film and theme park offerings. With these investments, we expect to add thousands of new direct and indirect jobs. 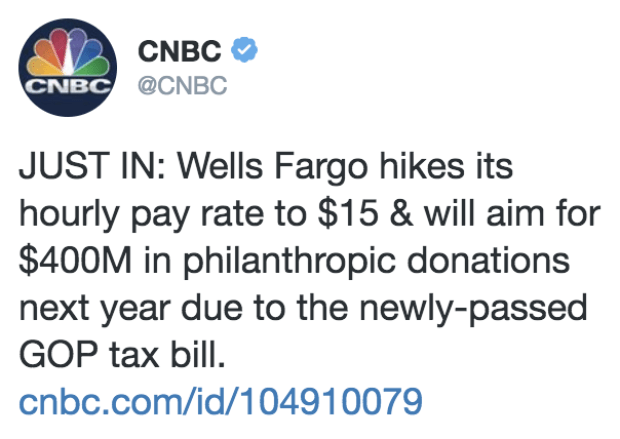 Wells Fargo will be raising their minimum wage to $15 an hour and donating $400 million to charity and philanthropy. 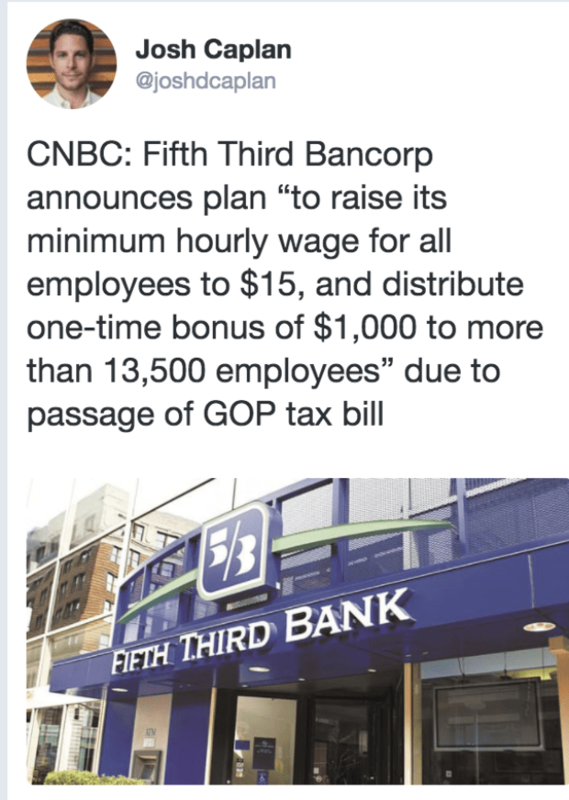 Over 13,000 employees of Fifth Third Bancorp will get a $1,000 bonus. They also announced that they are raising their minimum wage to $15 fan hour.